These gloves were found on a recent trip to a local thrift shop. They carry only an inside tag identifying the lining as 100% silk and giving a WPL number that corresponds to Crescendoe Glove Co. The gloves appear unused and were in their original plastic sleeve. They are made of fine, thin, cream colored leather with hand crocheted detail. The size is not marked but they measure 6.25″ around the palm and would be a size 6 or Small. They are 10.5″ long. When worn they would cover about half way up the forearm. The material is Crescendoe’s special washable leather. This pair of gloves is as supple and wearable as the day they were made. WPL numbers were changed over to RN numbers starting in 1959. These gloves can be dated to that year because of the confusing use of an RN number for a WPL number. The last WPL number issued was 13669 in 1959. For some reason Crescendoe used this odd label. I suspect it was a temporary problem, probably fixed within a few months. Because the gloves appear very clean, unstretched, and still contain this lightly applied label, I believe they are unworn. Crescendoe Gloves were a division or brand name of Superb Gloves, both companies being located in Johnstown, NY. Superb registered the Crescendoe name in 1942. Johnstown and nearby Gloversville once formed a center for glovemaking in the US. The area had many tanneries. In the 1800s glovemaking became a cottage industry in this region. The leather was processed and cut out in factories by men and the gloves were sewn together in homes by women. 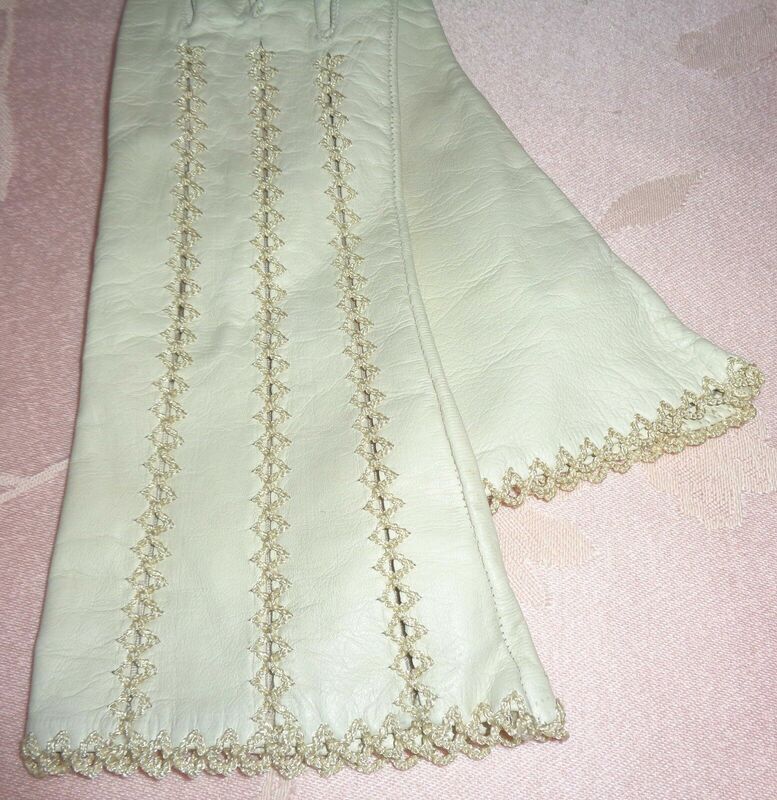 By the early 1900s, glove stitching also moved to the factories. A booming industry grew up in the area and continued into the final quarter of the last century. As fashion moved away from the daily wearing of ladies gloves, the industry died. Just a few glove manufacturers remain. 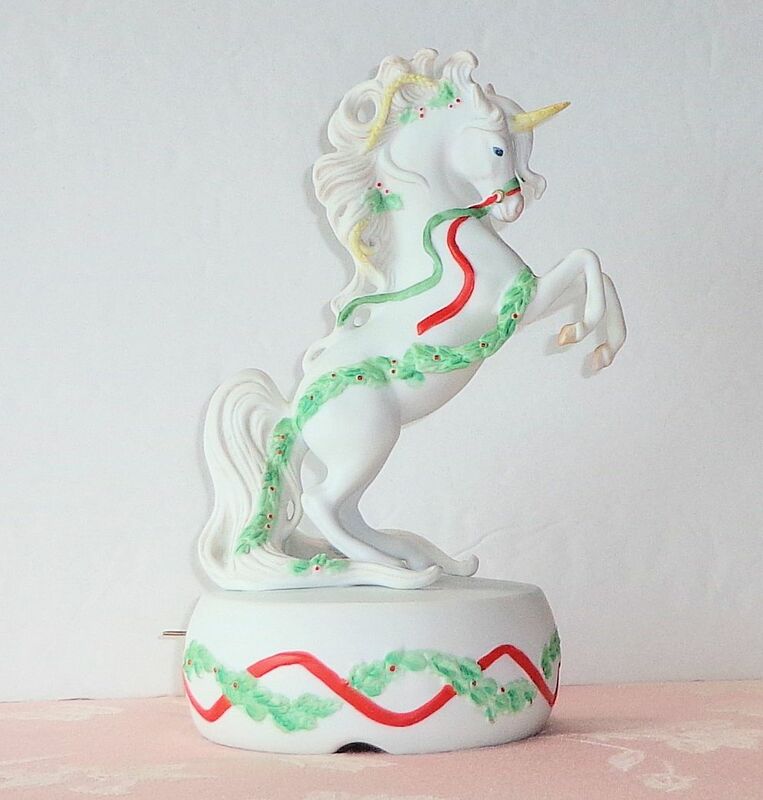 Crescendoe was a very popular brand from the 1940s into the 1970s. 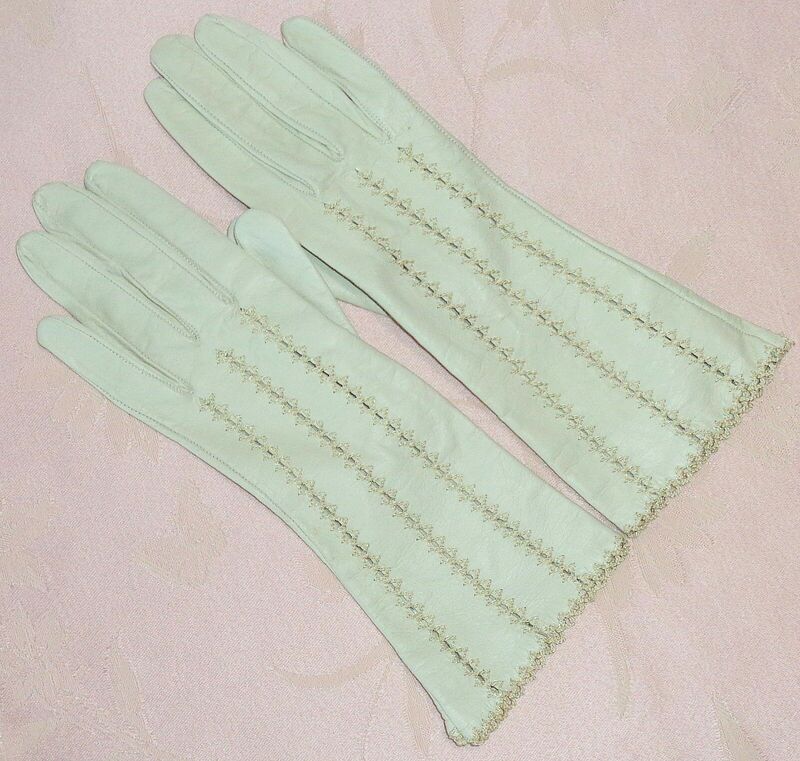 The wearing of fine, dressy gloves when going out was de rigueur for a fashion conscious woman. The right glove “made” a lady’s outfit, especially for evening. The use of gloves was also good hygiene and it protected hands from the weathering effects of sun, cold and wind. I bet chapped hands were less of a problem when glove wearing was common place. Crescendoe ran a very successful advertising campaign in fashion magazines. 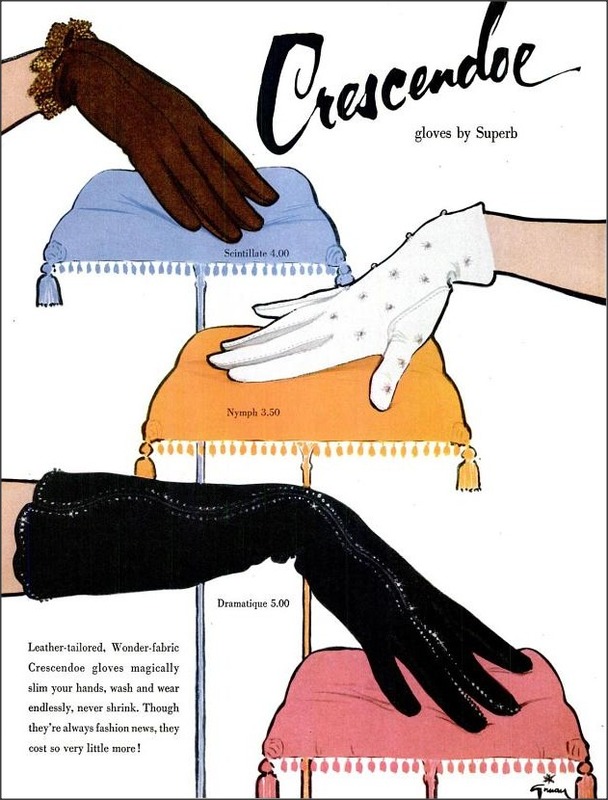 This illustration from 1954 by Rene Gruau highlights the attractiveness of the gloves. The company touted their product’s ability to slim the hands. Gruau was a famous fashion artist of the time. Use of his artwork represented an impressive investment by the company. Rene Gruau’s work can be found in museums today and he is acknowledged as a major contributor to haute couture. The significance of small discoveries in thrift shops, at yard sales, auctions and secondhand shops always amazes me. This pair of gloves was lost, jumbled amid a motley collection of worn-out hats, gaudy scarves, old hosiery and cheap fake-leather wallets in a bin. I knew when I saw them that they were something special and I was right. 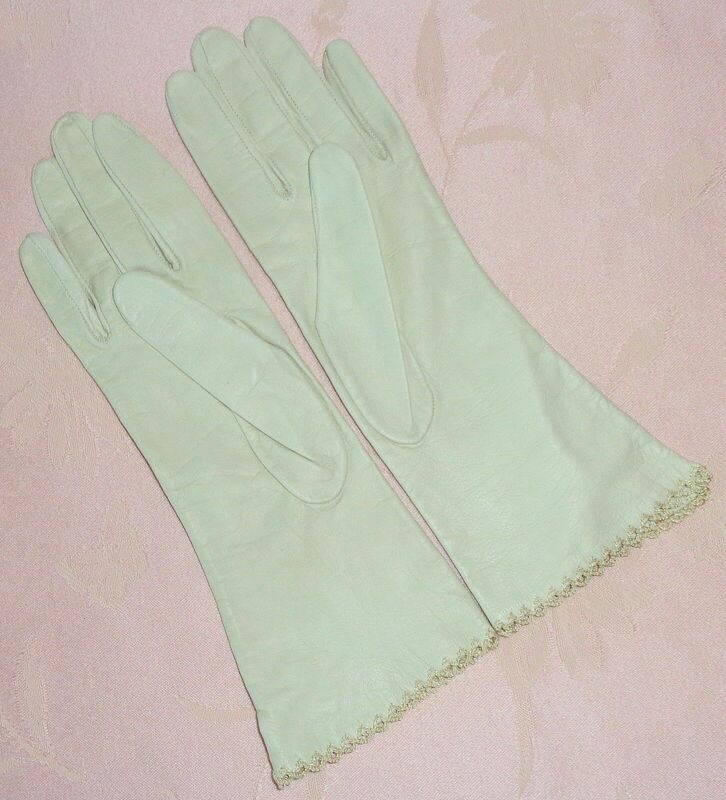 The gloves are listed in my eBay Phoenix Farm shop. 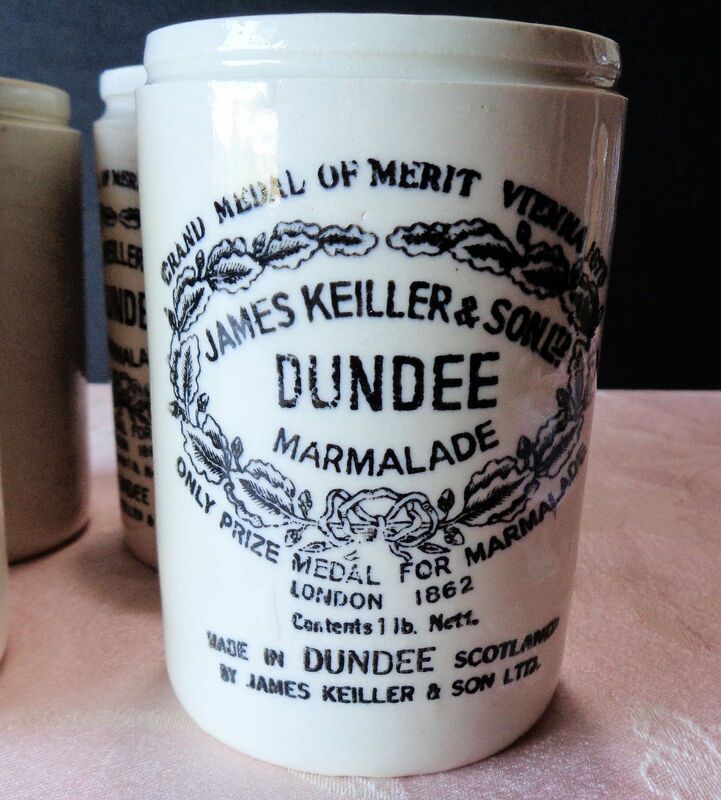 These old Dundee marmalade pots were found in a trash pit on property in Wiscassett, Maine that was recently purchased by my brother. 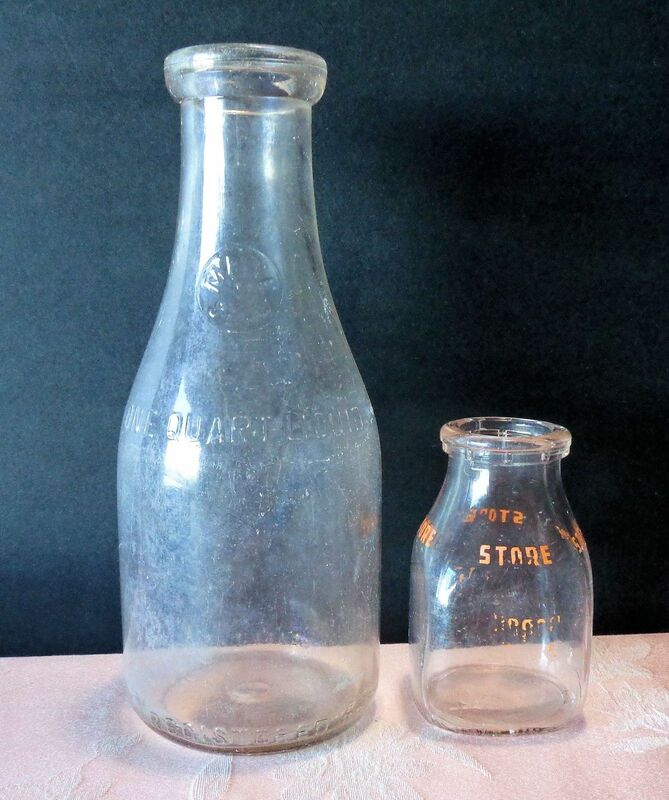 This summer while he was excavating in preparation for erecting power poles he dug out these jars plus a couple dozen old Coca Cola bottles and some assorted other odds and ends. My brother piled the finds in 5 gallon buckets and brought them to me. They were all covered and filled with thick clay. After a considerable amount of cleaning, and soaking in bleach, these pots look fairly presentable. They have some staining from rust, a few small chips and a couple are crazed. These and the rest of the goodies from the pit date to around 1949-1955. 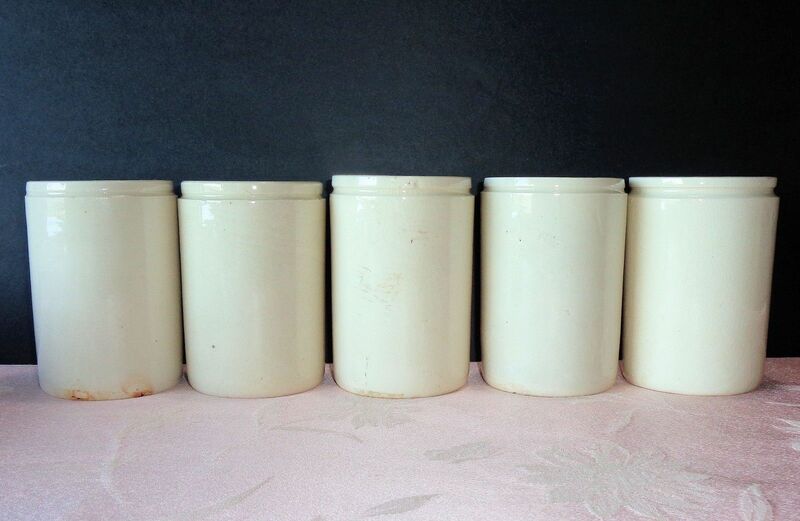 For some reason, old pottery marmalade pots are sought after. Perhaps people like them for decorating. They measure about 4.25″ tall and would be useful to hold things like pens or coins. These five recently sold at auction in my eBay shop for $70. A pretty good return on a few hours of elbow grease. Thanks brother for the generous gift! I still have to clean the Coke bottles before they can be listed. They are all from Maine or New England. Those bottles are not likely to be as valuable as the marmalade pots, but they will sell well. 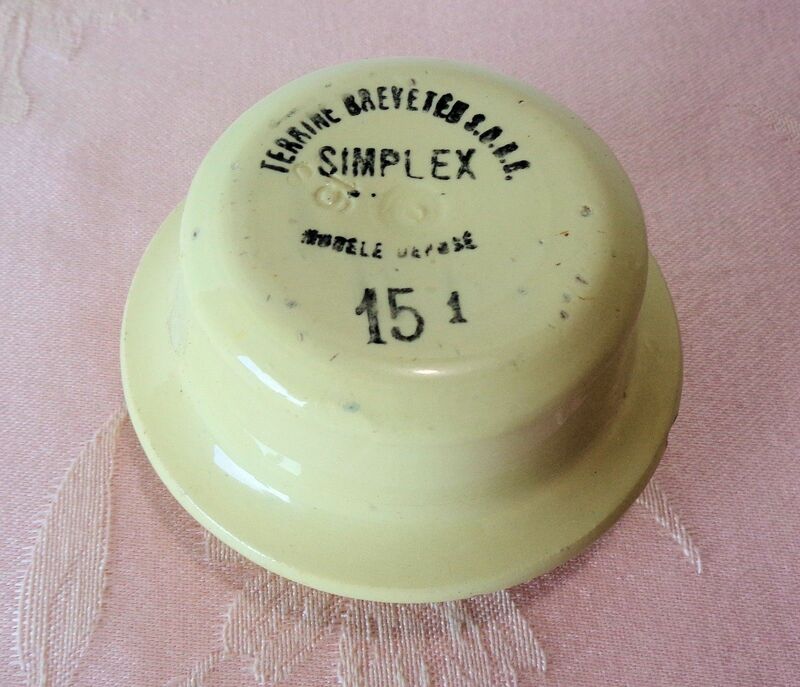 I also have listed some interesting old toiletry bottles and jars from the pit. They were quite dirty. 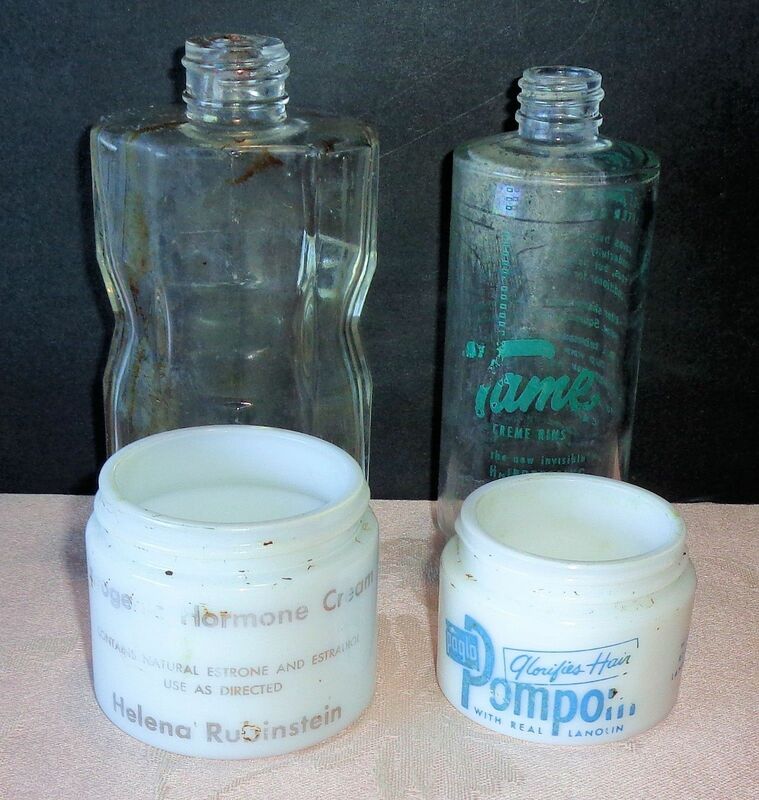 Some still contained remnants of the original product including the hair pomade and hormonal cream. The contents were black and sticky, a real joy to clean out. These all are from the same era, the early 1950s. The pieces are, clock-wise from the top left, a Lentheric aftershave or cologne bottle, a Tame by Toni creme hair rinse bottle, milk glass jar for Paglo Pompom hair pomade, with real lanolin (I’d love to smear that stuff in my hair!) and, Helena Rubenstein Estrogenic Hormone cream, purported to reduce wrinkles. The Tame bottle says “the new invisible hair dressing that rinses on.” Tame was a new product in 1953. My brother also dug out some old locally bottled soda bottles that have already sold. 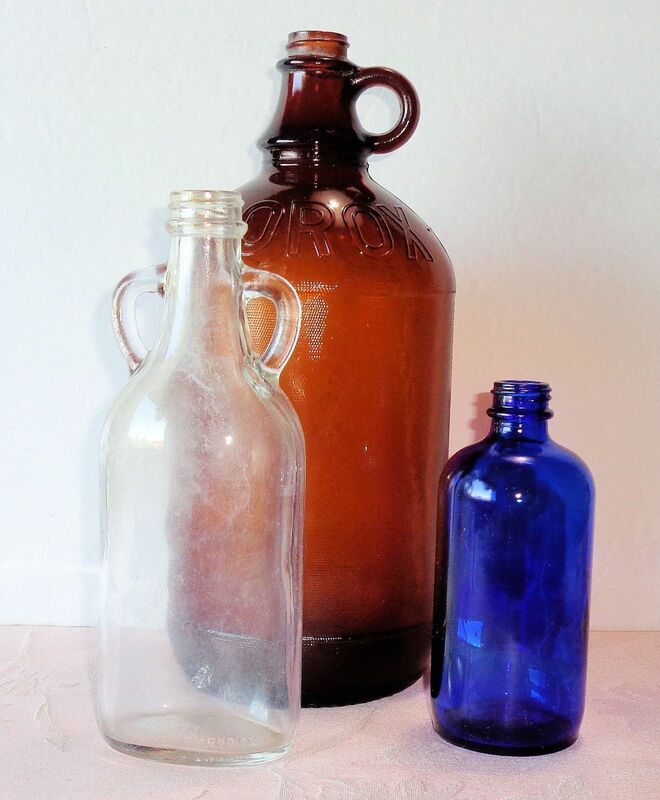 I have listed some household bottles for Clorox bleach, Vermont Maid syrup and perhaps an old Milk of Magnesia bottle that is dark blue glass, a couple old milk bottles from Maine and an amber bottle that once held Felton’s rum. He also found the lid for a French pate pot and the enameled cast iron top for a Volcanic color Le Creuset roasting pan. The roasting lid is too corroded to rescue, unfortunately. Altogether, the trash pit was a good find with some well preserved treasures from mid-century America. It is interesting to see what sorts of products a particular family in Wiscasset used during the early 1950s. Perhaps not as exciting as excavating a medieval, Roman or pre-historic trash midden, but entertaining enough for me! 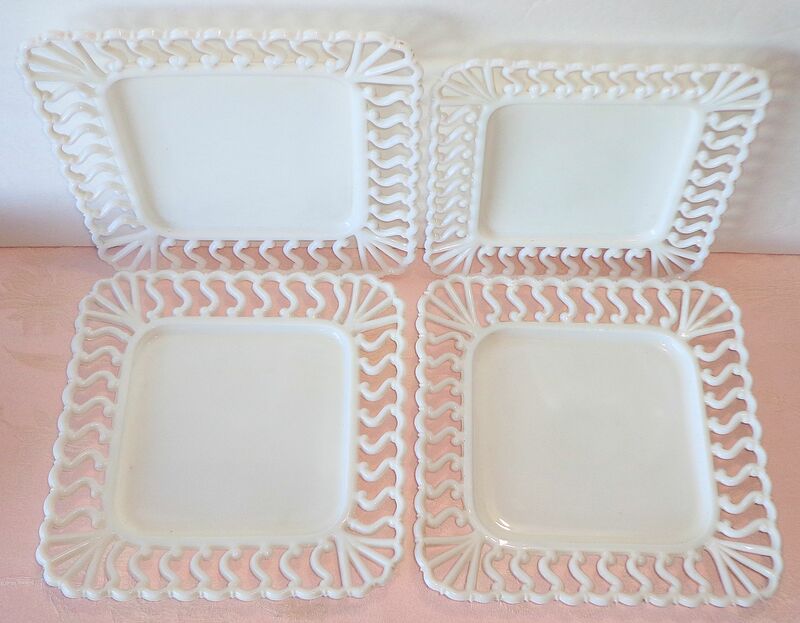 Last week I had the good fortune to discover this set of four delicate white milk glass plates at a thrift store. It is amazing that such breakables have survived with no chips or cracks. The pieces were made by Atterbury Glass of Pittsburg, PA. 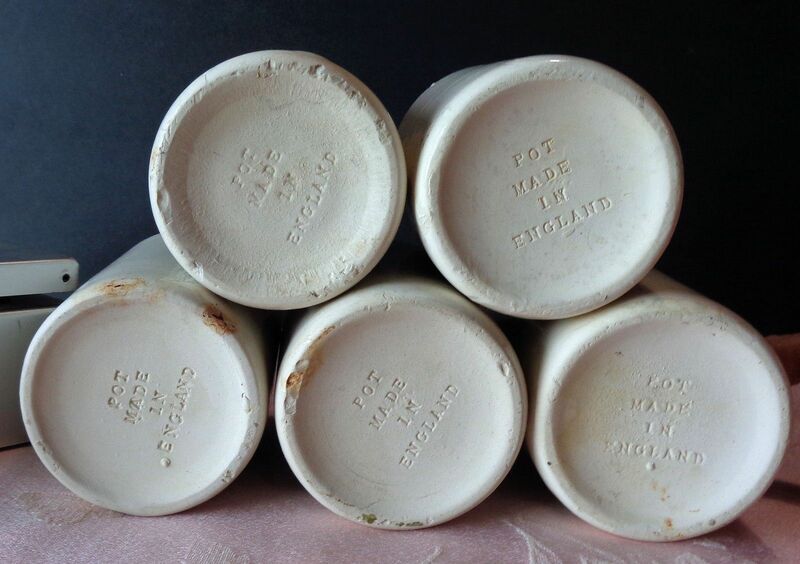 They are marked on the backs with a capital A. Atterbury was in business from approximately 1859-1902. So these plates are antiques. They appear nearly new with just the slightest scratch here or there from a utensil. The beautiful open-work borders with their S-shape are so prone to breakage that I was very careful to examine the margins for hairline cracks. My eyes are getting old, but I don’t think I missed any damage. This sort of work is termed Early American Pressed Glass, EAPG. It can be distinguished from later glass by the imperfections inherent to the material. 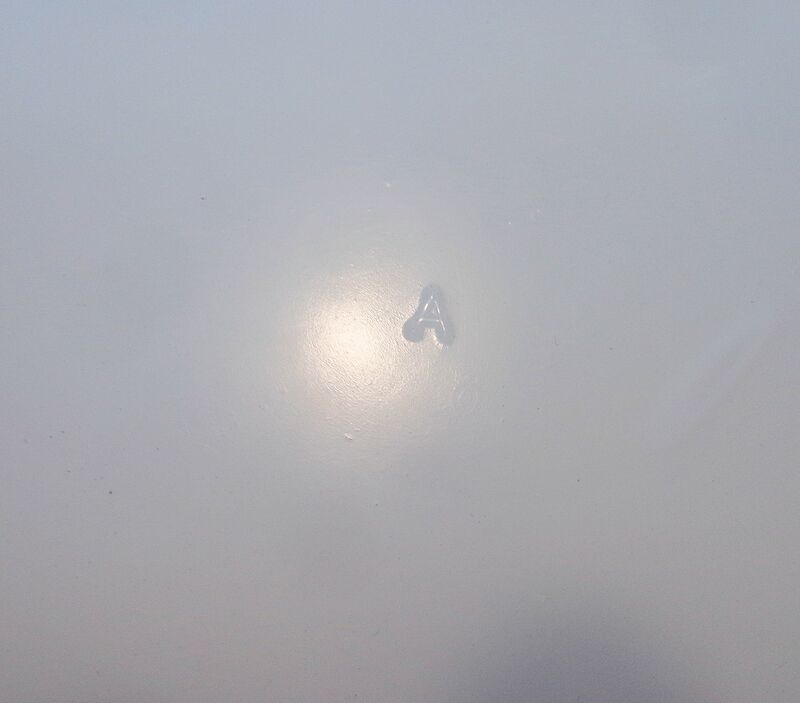 The glass will have flow lines, straw marks, tiny trapped bubbles and roughness around the edges where the pieces were knocked out of the mold. As time passed and glass manufacture became more technically advanced, these mars were eliminated. Thus, in this case the age of a piece can be told by its blemishes. 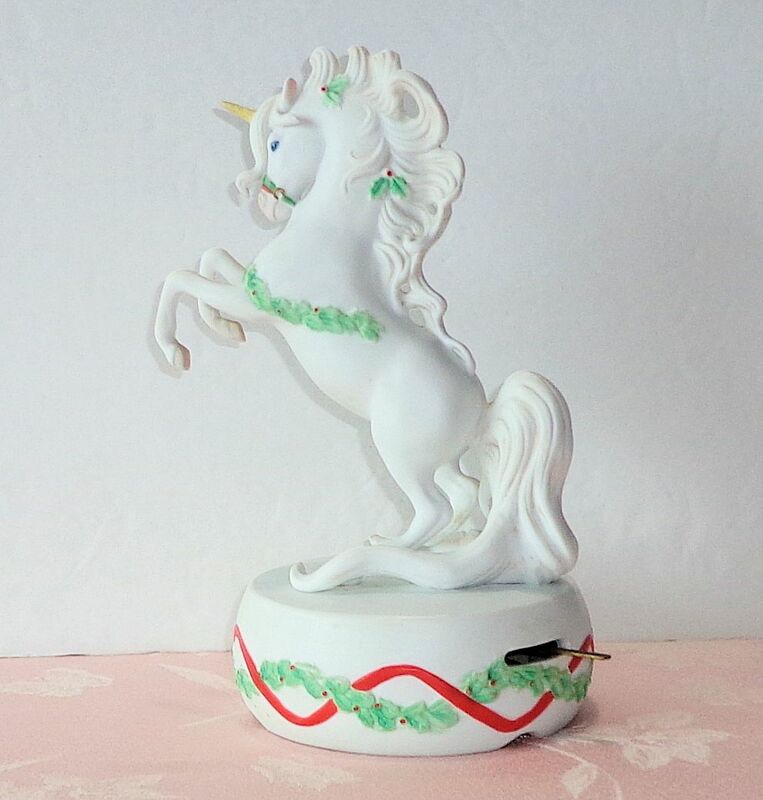 Atterbury produced tons of milk glass, the company was renown for it. 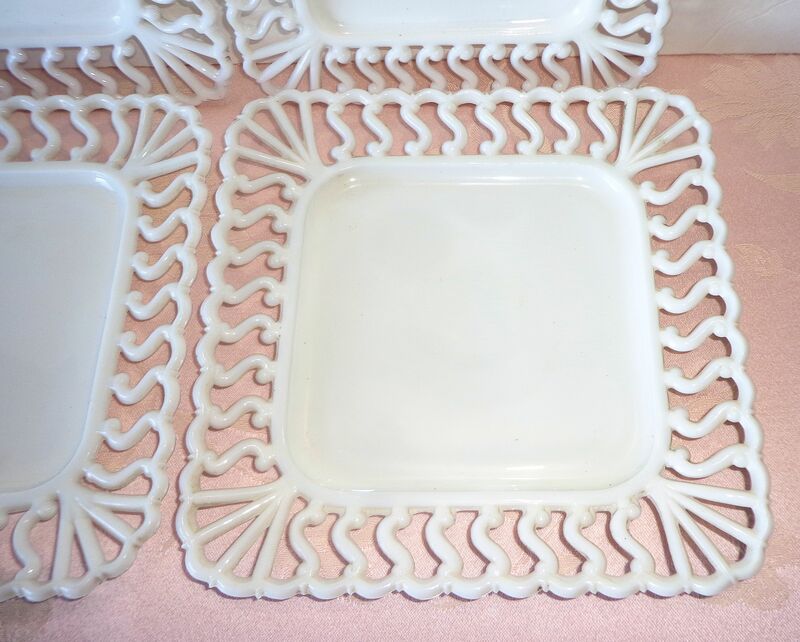 Some of their most popular pieces included hens and other animals on nests covered dishes, cups, and lacy open work pieces. This S-shaped lace design has a decided gilded age feel to me, perhaps produced sometime in the 1880s. This is just a guess. 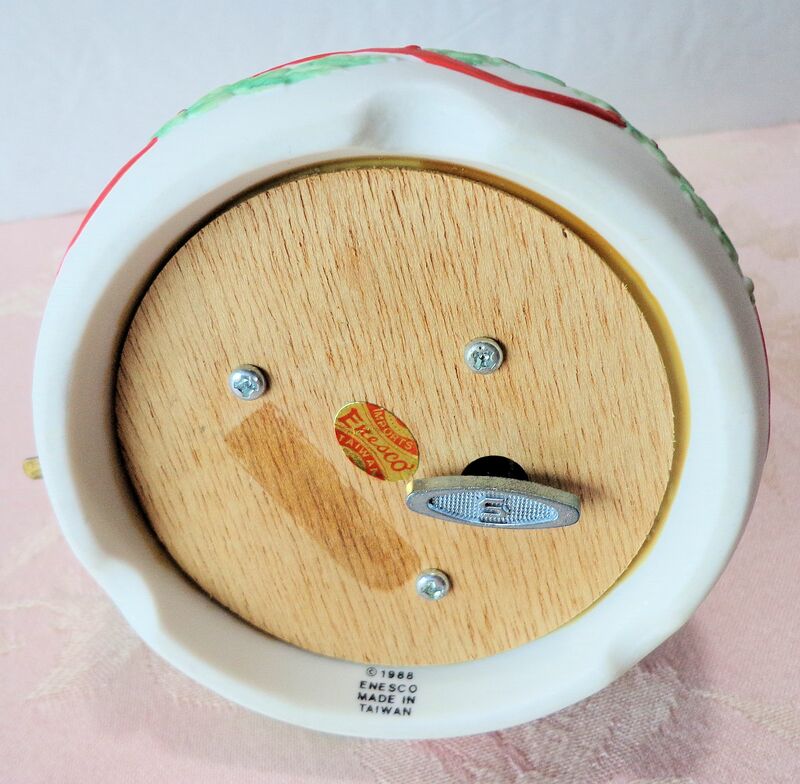 Information about the company’s production, and especially the marks used, is very limited. After the company went out of business, some of its molds were apparently sold. Westmoreland Glass later made an identical pattern under its own mark. 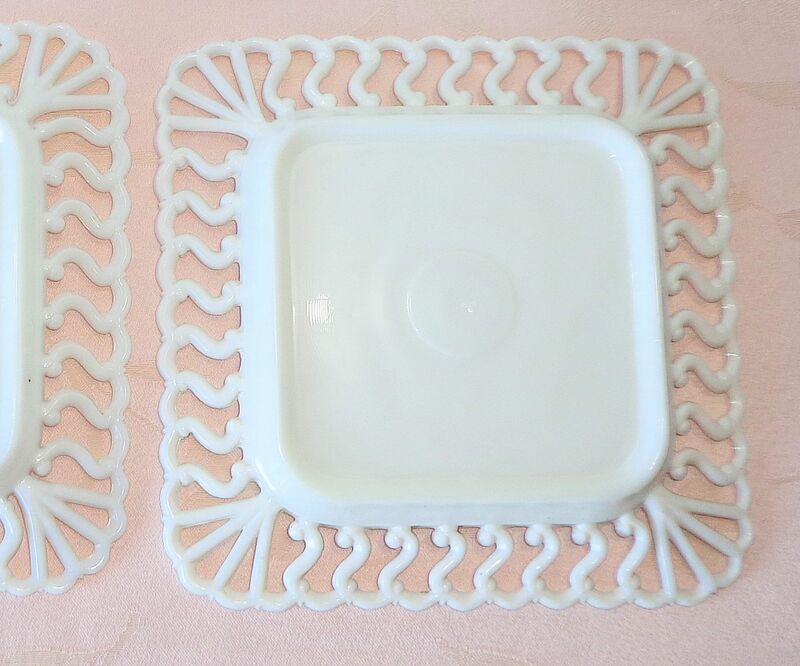 Included in the set are three dinner plates measuring 8 3/8″ square and one salad plate at 7 3/8″. I paid less than one dollar per piece and hope to realize a sale price of ten dollars each in my online shop. 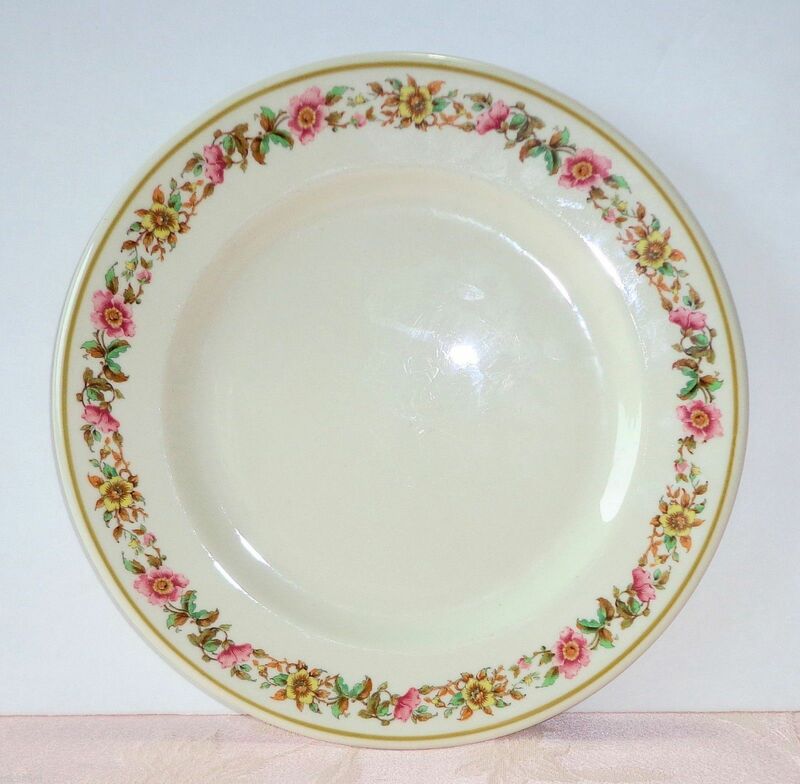 The last similar one sold for $9 and it was a single plate. 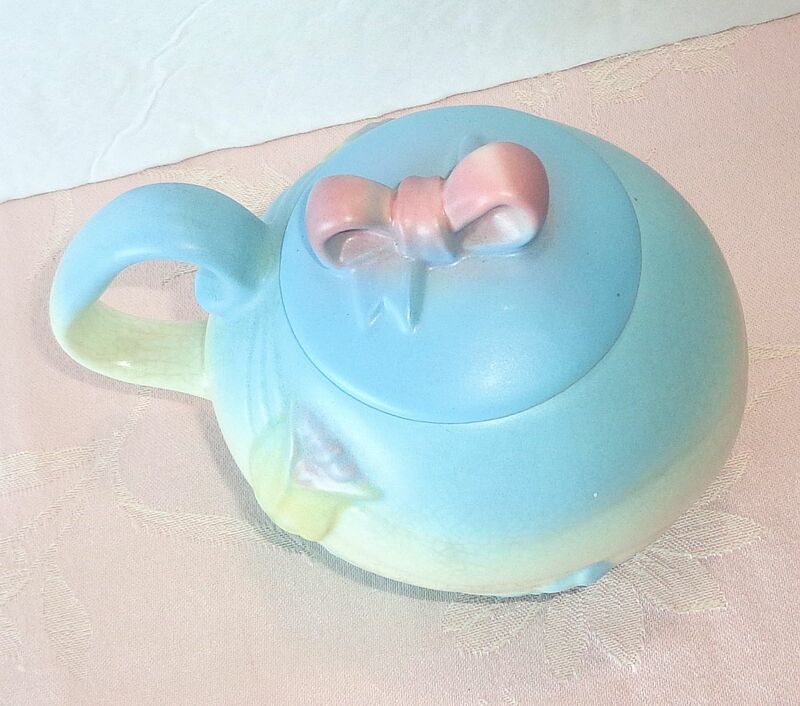 This recent thrift shop find is a rare sugar bowl by Hull Pottery in the Bowknot or Bow Knot pattern. It was made between 1949-1950. This short production run is likely why such pieces are hard to find. 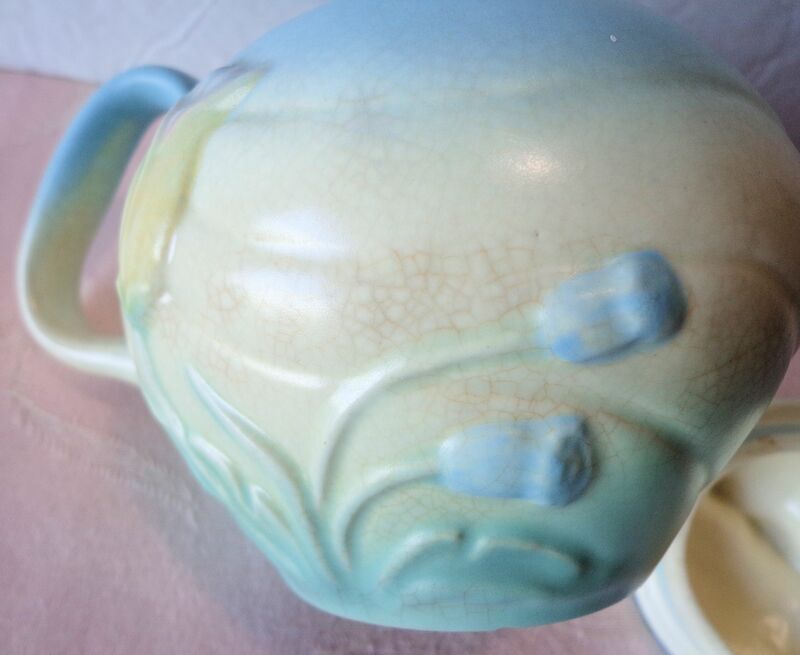 Hull began producing art pottery in the 1920s and by the time this was made they were in their art heyday. I love the organic lines and lovely muted colors of this pattern. And who can resist the adorable bow on top? 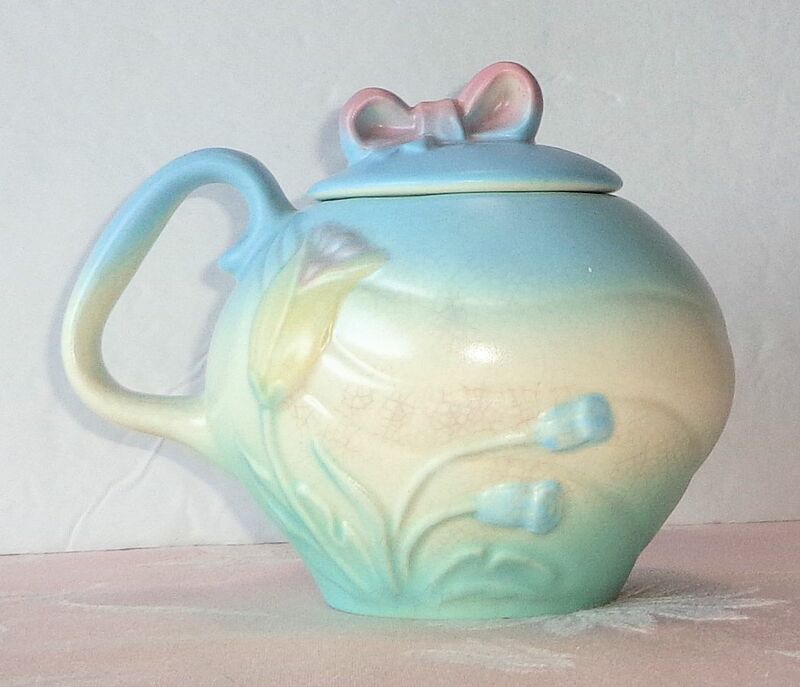 This is a large sugar bowl, measuring about 5″ high with the lid. The base can hold a lot of sugar, at least a couple cups! 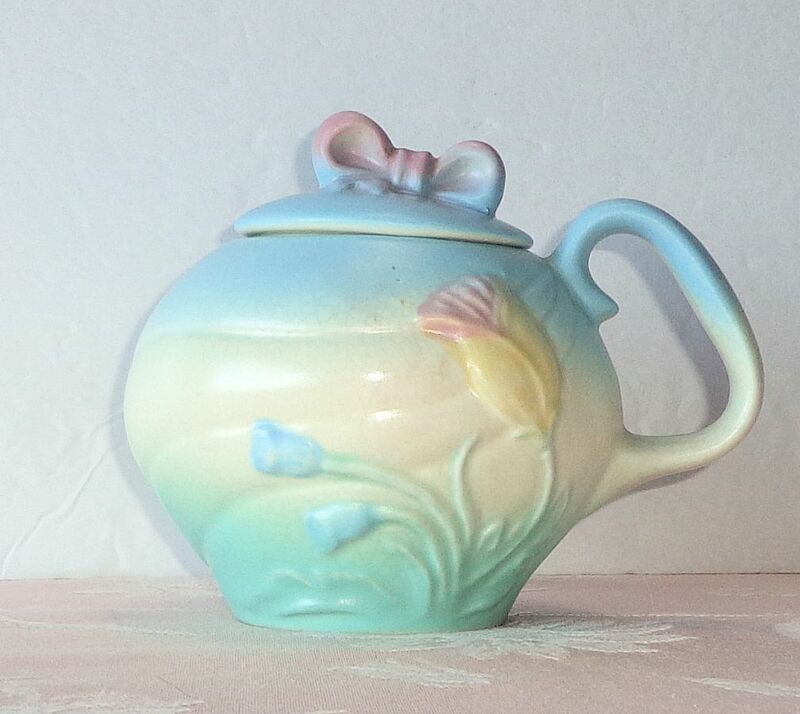 The sugar bowl is part of a set that includes a teapot and creamer. Due to the rarity, these pieces can get pricey. The glaze is called matte but feels smooth and satiny to me. My find has a 1/8″ chip in the foot and light, fine crazing over most of the body inside and out. 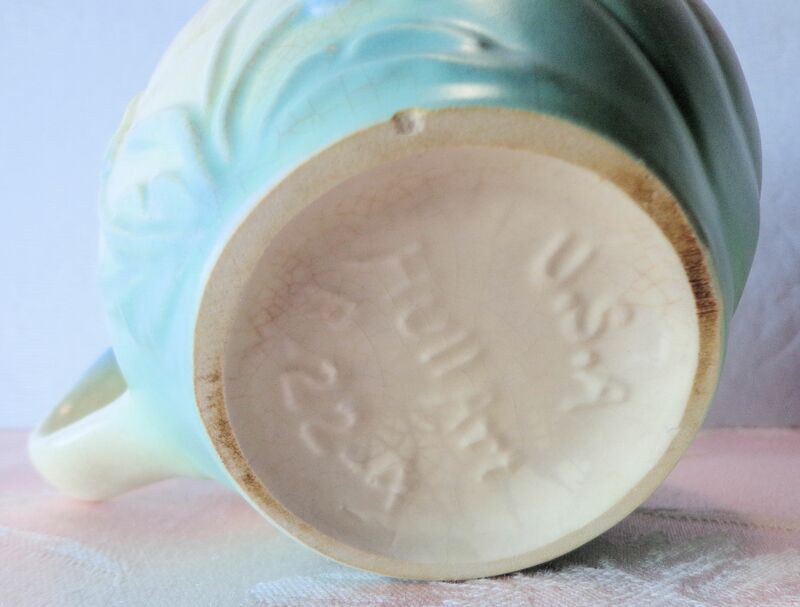 Crazing usually occurs when the glaze and body cool at a different rate after firing. The glaze shrinks too quickly and something has to give. I actually do not mind crazing most of the time. When stains get into the craze, I’ve found that soaking in a strong bleach bath will greatly reduce the stain. This is what makes scouring thrift shops, flea markets and yard sales such a fun adventure. I acquired the piece for less than $6, cleaned it up a bit, and have it listed for sale for $30. A somewhat nicer example with less crazing and no chips sold for nearly $70 recently, so fingers crossed! Restaurant ware is a broad range of dishware that is produced specifically for use in…you guessed it…restaurants. It is appropriate for many industrial or institutional purposes such as cafeteria or hospital use. Much of this ware was made for railroad dining cars. Patterns were created and reserved specifically for certain establishments. 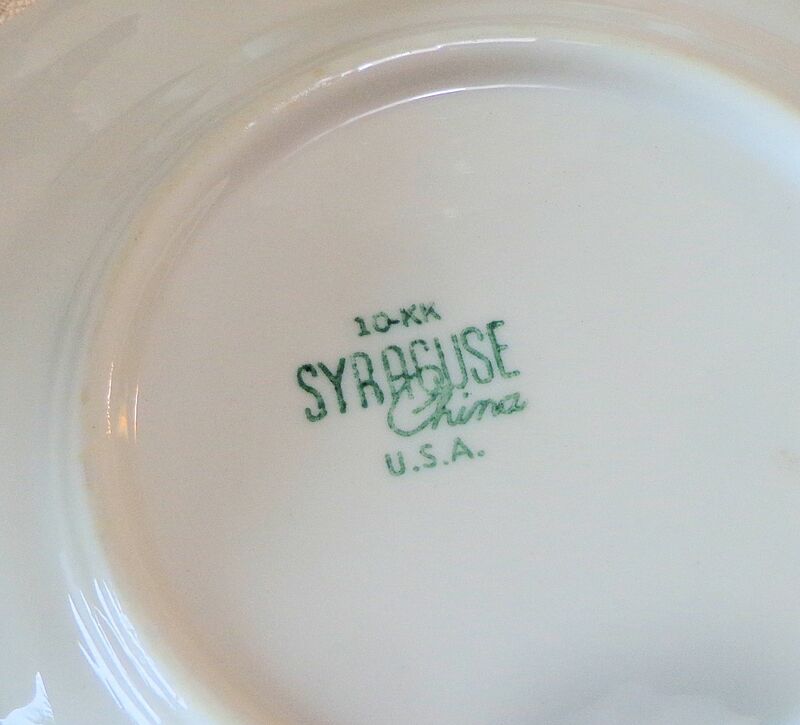 Military officer’s tables are graced with dishware bearing specific service logos. Many restaurants have their own logo ware. Organizations and clubs also invest in tableware bearing their emblems. 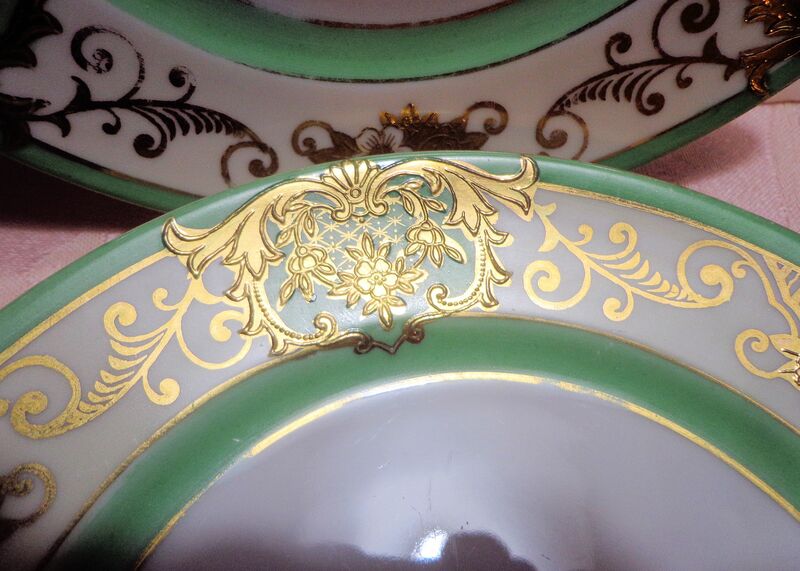 Collectors build sets of restaurant ware and some pieces, especially older or rare ones, command high prices. 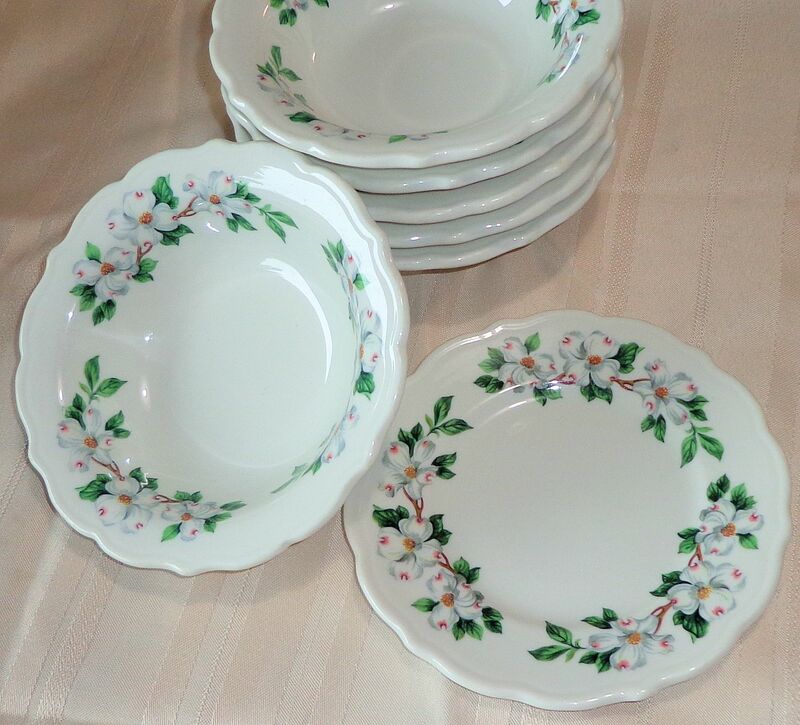 My own restaurant ware interest is in Syracuse China Dogwood pattern. Some of my pieces are pictured above. This design, with the scalloped edge is on the Winthrop body shape. There is also a plain, straight rim with the same decoration that I’m not opposed to collecting. I love the dogwood blooms. It is one of my favorite flowers. Reminds me of the beautiful little spring-flowering dogwoods brightening the dark woods of my North Carolina childhood. This pattern was used by the Norfolk and Western railway in their Roanoke Hotel restaurant. The 10-KK date code corresponds to Oct. 1956. 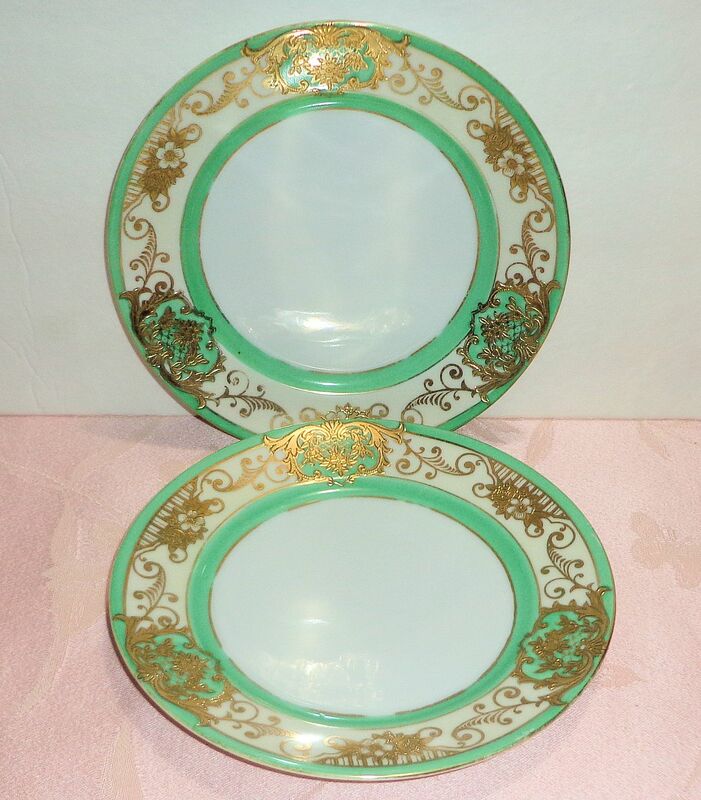 There are and were many American manufacturers of restaurant ware. Some big names include Syracuse, Buffalo, Shenango, Homer Laughlin, Mayer, Jackson, Wallace and Tepco. 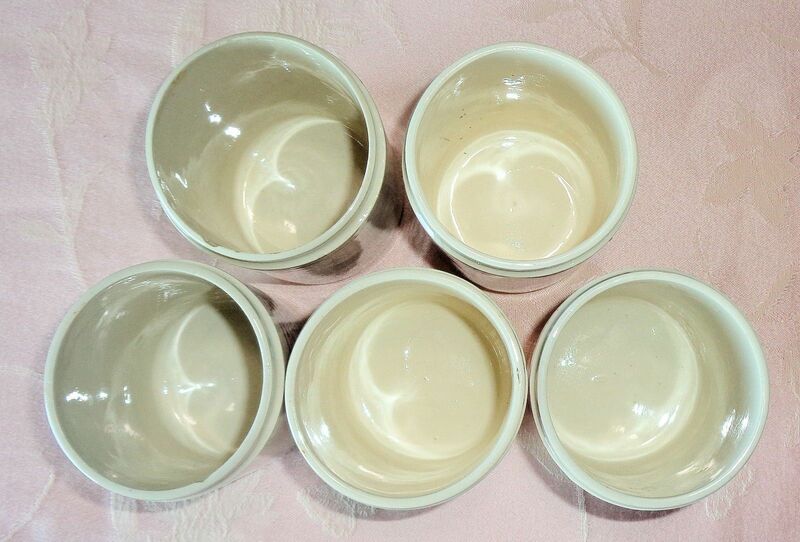 Their products were thick, heavy weight vitrified china. This material could withstand the hard commercial use without chipping, cracking or crazing. 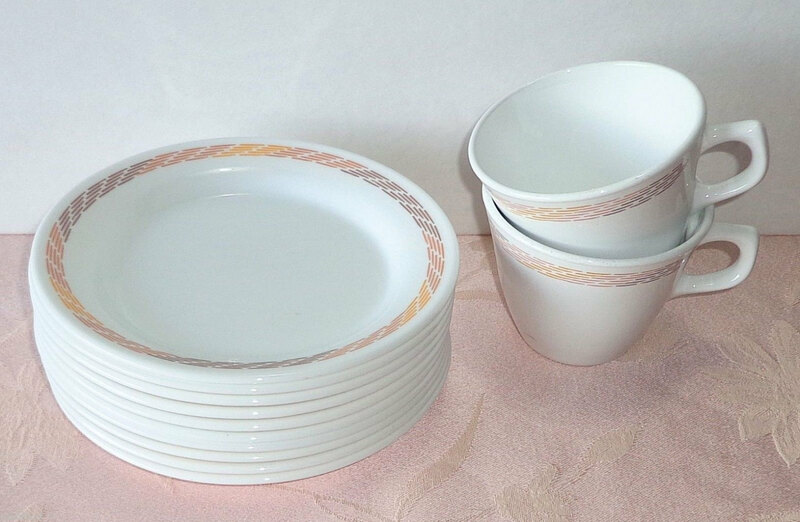 Corning produced lines of restaurant ware using their ceramic glass formulas and these products were also much thicker and heavier than household dishes. 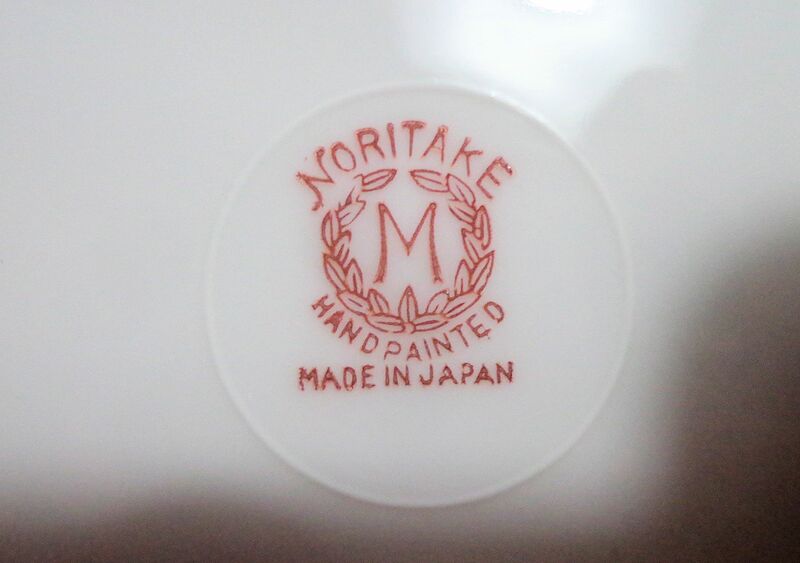 Restaurant ware is produced in many other countries and there are avid collectors of non-US varieties of dishware. Sometimes the pieces from particular establishments are prized or certain shapes such as platters. 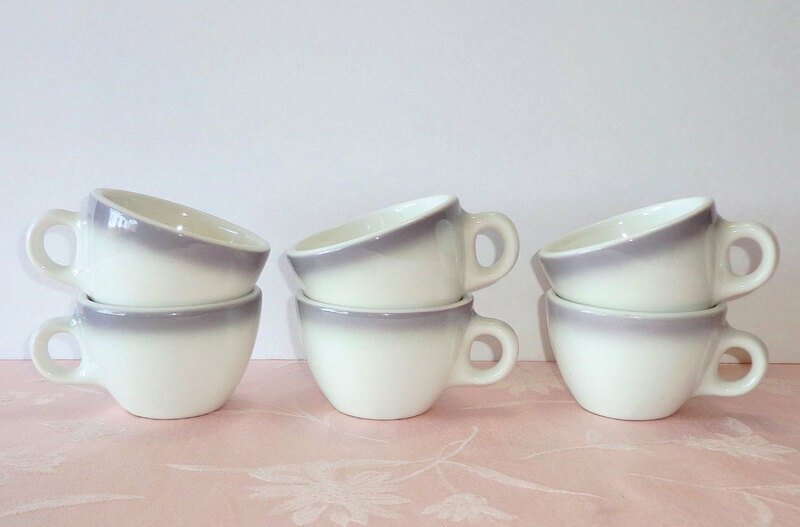 I have a fondness for bouillon cups. They are so cute! 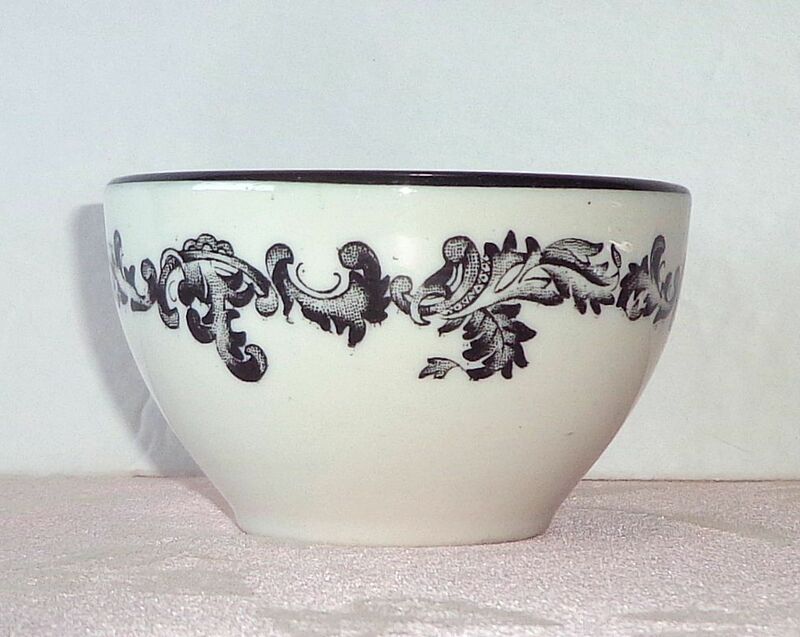 Vintage ware from closed potteries is popular. 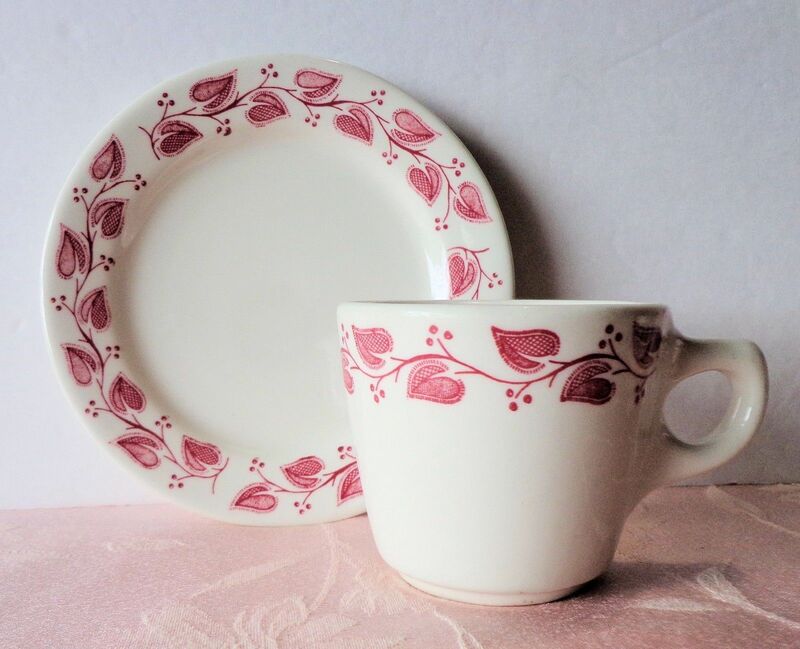 In my online shops on eBay and Etsy I currently have a small selection of restaurant ware. 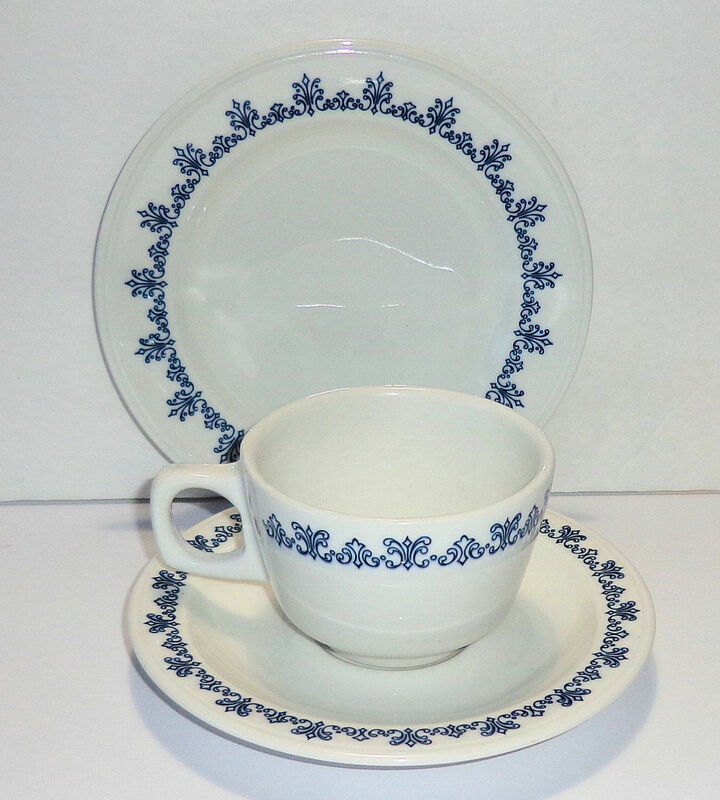 Most of the pieces for sale are by Buffalo China or Syracuse. There are a smattering of offerings from other manufacturers as well. 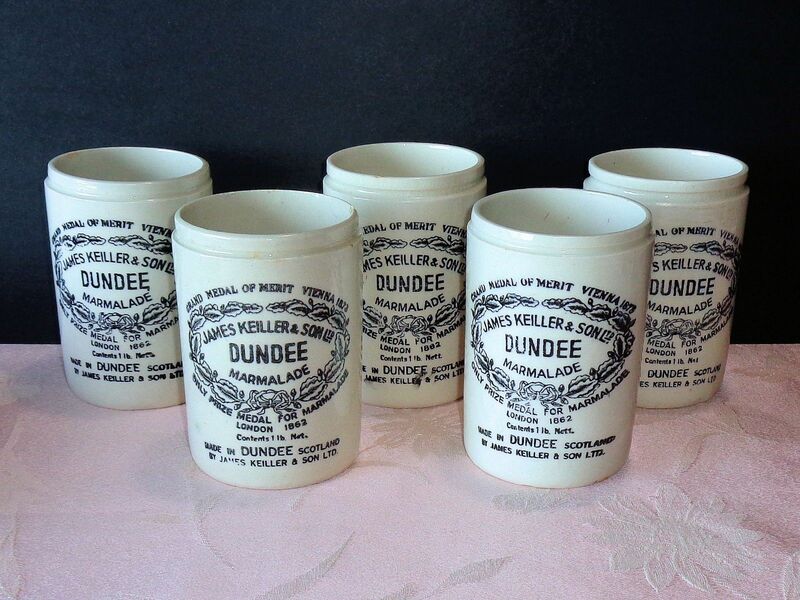 Restaurant ware is a strong, perennial seller. Collectors look for examples that are in the best condition possible. Since the dishes have likely seen service, most will carry use marks, usually utensil scratches and rubbed areas from stacking. Pieces with light to minimal signs of use are often listed at premium prices. Rare shapes or patterns can cause bidding wars. Whenever I come across a restaurant dish in good condition, I snap it up it knowing it will sell.